On Monday we had the valuation of our lovely house and it will be up on the market, officially for sale within the next ten days or so! I think if we could take it with us we would! So that is exciting, although, admittedly a little stressful, but let's focus on the exciting! Yesterday, I ran the first of a series of jewellery making sessions and it was fabulous! There were eight ladies who were all lovely and so interested in the work and even asked me to tell me more about myself, makes a fabulous change from, um, less fun teaching experiences! After the session each lady had created a multi strand memory wire bracelet and a pair of earrings! I'm really impressed with the Workers Educational Association and so glad to be working for them! They offer a huge array of courses including literacy, numeracy, English as a secondary language, painting, creative writing, gardening, poetry, history. . . the list goes on! If you fancy having a go at something new or refreshing some dormant skills do check them out as they are all over the country. R starts teaching his Romantic Poetry course for them in Wolverhampton tomorrow so we're all about the WEA in this house at the minute! More exciting news is that I made a sale through Facebook the other day, somebody spotted the 'A Satisfied Mind' Charm Bracelet and got in touch to say they'd like to buy it! I do love the tones in it and am going to make a second, similar one to keep in my Folksy shop. 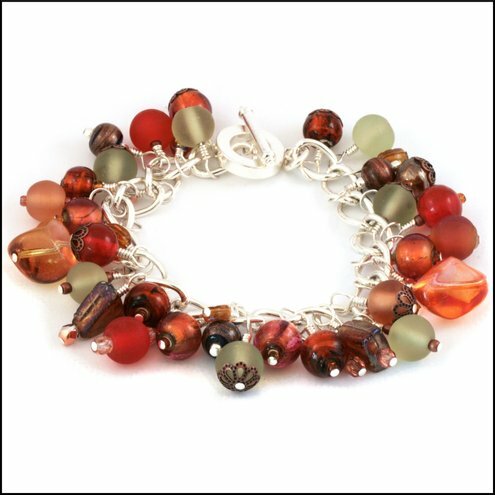 The bracelet is inspired by a chapter in Charles Frazier's Cold Mountain which is packed full of sumptuous Autumnal descriptions of apple picking, burning brush and evening skies, gorgeous!